Why am I amazed with serums? Probably because they are concentrated forms of age fighting ingredients and incorporate the latest in technology. 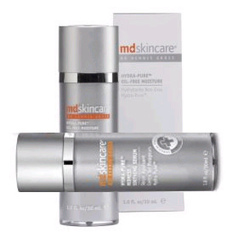 We previewed the addition of MD SKINCARE’s Hydra-Pure serums line back in July and we were finally able to try some out. My pick of the litter right now is the Antioxidant Firming Serum ($95/1oz @ dermstore.com). With the season changing, my skin has been looking a little sullen and well, bored. This one contains 14 collagen-building ingredients and uses the same delivery system as their Body Cream, Hydra-Pure Chelating Complex. Since we’re not really about listing complex ingredients that only confuse the average beauty buff, we’ll just say that this one delivers what it says – a boost the overall appearance of the skin and wrinkles. Isn’t that all we want out of life anyway?